Urban Sketchers Seattle: Hello everyone! And a bit on our last outing to the Gates Foundation! Hello everyone! And a bit on our last outing to the Gates Foundation! Hi everyone! 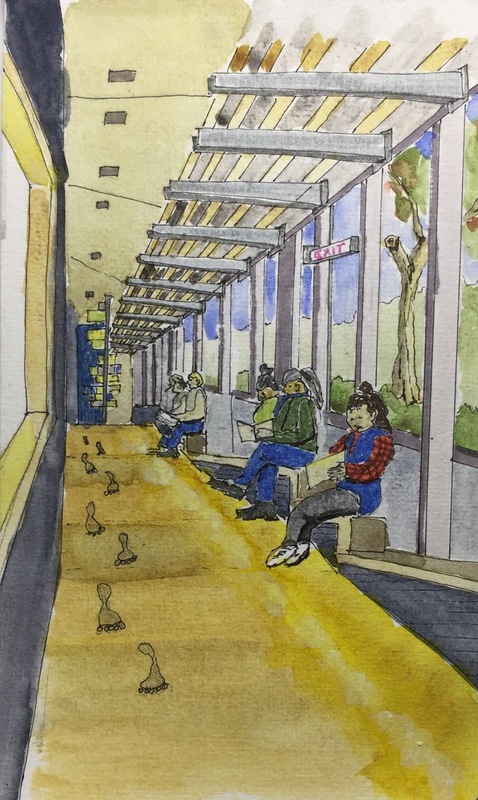 My name is Dave Somers and the Seattle Urban Sketchers recently invited me to participate as a Correspondent as well as a sketcher! I am looking forward to this as a way to keep me sketching, perhaps even more than I have been, and to do more digging about the places we visit on our outings. I moved here to Seattle from Hawaii for work about 6 years ago and my wife, Casey, joined me a few years later after leaving her position in California. We live in West Seattle now and love the area, though we knew we would. Seattle, and West Seattle in particular, has been a second home for us in terms of long time friends and our love of ocean and mountains. We plan on being here a long while. And since I am retired from the National Park Service now I can focus a lot on my hobbies, including Sketching! I started sketching less than a year ago. I took an adult ed drawing class at South Seattle Community College so I could better jot down ideas for another serious hobby I have, turning wood on a wood lathe. I hoped that some sketching skills would help me draw better ideas that I could actually make sense of a year or two later. In the process I met Darsie Beck, a Tacoma Urban Sketcher. He suggested I look up the Seattle Urban Sketchers as a way to build my skills and meet some fun people in the process. I did that and am hooked now, both on the sketching and the folks in the Sketchers!! I have been trying hard to make every outing I possibly can since starting with the group last Spring and now heading into Autumn. This last Saturday, Oct 8, the Sketchers were invited by WSU to join up with one of their Architect Classes that was traveling down to Seattle to spend some time sketching at the Olympic Sculpture Park. We got "weathered out" though and ended up sketching at the Gates Foundation Visitor Center near the EMP or Experience Music Project. It turned out there was a large group of students and a few instructors, plus YungChing Hung and Stephanie Bower from the Seattle Sketchers. I had been in the Gates Foundation VC a number of times, but this was all before I started sketching. I was focused on the exhibits of their numerous projects and ideas, and enjoying the feel of the space, but didn't really pay attention to the interior otherwise. This time though, with sketch pad in hand I started noticing. It was an interesting place to sketch. Perspective lines running everywhere, subtle color changes and contrasts, and lots of people. Sketching people is not a strong point of mine and there was a herd. Ohh boy. It was fun though. I tackled an interesting corridor along the outside wall of the building and had fun with that. I should add at this point that the floor actually did have bare footprints burned into it. I am not sure if they had a wild day with a firewalking ceremony or if this was an artistic embellishment. I didn't see a description of it and will have to go back and dig a bit to find out the significance of these foot prints. Stephanie was fun to watch sketch. I took her Craftsy class so I had seen her sketching in that context, but to see it happening in person was a kick. Even more amusing though was the fact that seemingly all of the WSU students knew her from a class she did for them a few years ago. They all remembered her and the class quite well and very fondly and were delighted to see her again. She got mobbed a few times which was pretty fun to see. The class got together at the end of the session to share their efforts, much like we do. It was clear that they had been at this awhile and were getting quite accomplished. It would be interesting to try and start an Urban Sketchers group up there with these folks as their core. I have a feeling it would be a popular and active group. I am off to listen to the rain falling with a cup of tea in hand! Thanks again for asking me to participate as a Correspondent everyone! Will do my best to participate fully!! Hopefully I will see you at the next outing with raincoat and rainpants in hand if the latest weather reports are accurate!